If writing lyrics and melodies makes your heart sing, then Songwriting Studio is perfect for you! 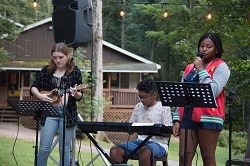 At Writopia’s Songwriting Studio, recording artists trained in the Writopia Teaching Method lead teens (ages 11+) in writing and recording their own original compositions. 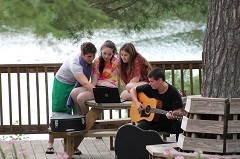 Instructors versed in rap, pop, rock, and musical theater work with students to help them to explore musical genres, craft lyrics, and gain confidence in the recording process. Students will leave Songwriting Studio with a recorded EP of 2-3 original songs of their own or in collaboration with other students. Students develop their projects according to their own artistic vision and instructors assist with cultivating and supporting those goals. Students will be taught the full studio experience by learning to mic instruments, and record, layer, and edit tracks in Garageband. Songs of all musical genres are welcome! Some experience with a musical instrument is recommended but not required. Instructors meet students at their skill level and assist each individual in improving, experimenting, and defining their own style. For those advanced musicians we also have the Advanced Songwriting Studio program, you may apply here and submit a video or recording of your songwriter. Check out a couple of songs from our SoundCloud channel!